When we first visited the village in 2008 they had no clean water in the village. The women would either walk several miles to the nearest wells and walk back with a large, heavy basin of water on the head or use the water from the close by but dirty river Mono. This is the same river that was, and indeed still is used for going to the toilet, washing; the same one with dead animals in it. This collected river water was cleansed by the ultra violet method which has some merit but is still very unhealthy leading to all sorts of illnesses. We felt we had to make the provision of clean water one of our first priorities. 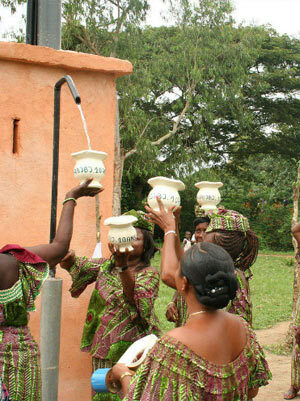 By the end of 2009 we had raised enough money for two drilled wells; much better than hand dug ones! So in early 2010 the wells were completed. Whilst the drilling rig was in the village we got a third drilled because of our colleagues in Togo paying a small amount of extra money. One of the three wells has a hand operated pump to fill basins or buckets at ground level. The other two have raised outlets so that the women can have the basin on their heads ready to walk away. 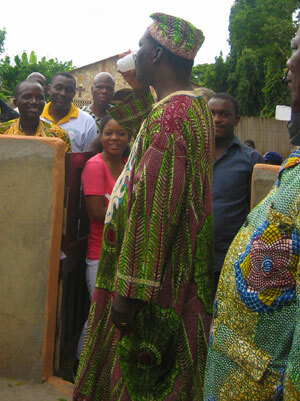 The water of these two wells was initially pumped up to a tank by the use of a generator that our friends who live in Lome the capital brought with them when they visited. But now we have provided solar powered pump to the well by the Clinic.